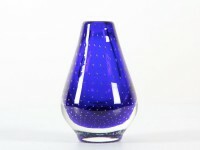 Finnish Nuutajärvi was established in 1793, but it wasn't until the late 40's with the contributions of Gunnel Nyman that quality art and household glass came into regular production. Kaj Franck was appointed chief designer for Nuutajärvi in 1950 as part of his duties at Arabia, Nuutajärvi and Arabia were both owned by the industrial concern Wärtsilä. Other notable artist that worked for Nuutajärvi includes Saara Hopea, Oiva Toikka, who became art director in 1963, and Heikki Orvola. Nuutajärvi was marketed under trade name "Arabia" from 1971 to 1977. 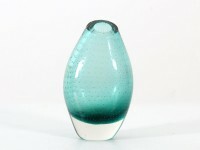 In 1988, Nuutajärvi merged with Karhula-Iittala and is now part of their Pro Arte department. 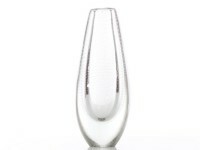 Gunnel Nyman Glass Vase by Nuutajärvi in Finland. Perfect condition. Signed. 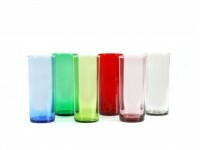 Set of 6 Scandinavian glasses. Model Purtilo.